Chad Moir turned his resentment against Parkinson’s disease into a chance to help others fighting the disease that took his mother. As they don boxing gloves and pound away, with various levels of force, at punching bags suspended from the ceiling, the late-morning crowd at this Southampton gym looks a lot like a group exercise class at a typical fitness center. Except that most of them are older than the usual gym crowd. Oh, and all of them are battling Parkinson’s disease. Tricia Enright started volunteering at DopaFit before joining Moir’s team as a fitness trainer. Tricia Enright says she’s inspired not only by members’ physical progress, but by the support they give each other as well. It’s not just boxing. Members at DopaFit, all of whom are at various stages of Parkinson’s, engage in numerous forms of exercise, from cardio work to yoga to spinning, and more. On one level, activities are designed to help Parkinson’s patients live a more active life by improving their mobility, gait, balance, and motor skills. But research has shown, Moir said, that it does more than that: Exercise releases the neurotransmitter dopamine into the brain, slowing the progress of Parkinson’s symptoms. Moir has seen those symptoms first-hand, by watching his mother, stricken with an aggressive form of Parkinson’s, decline quickly and pass away five years after her diagnosis. He used a half-marathon in New York City to raise some money for the Parkinson’s Disease Foundation, and ended up collecting about $6,000 — an exciting tally, as it was the first time he’d ever raised money for a cause. And he started to think about what else he could do for the Parkinson’s community. These days, a visitor to DopaFit will typically see around 25 people working out. “Really, it’s set up like a regular gym would be — aerobic training, running, dumbbells,” Moir said. The difference is the clientele — and the progress they’re making toward maintaining as active a life as they can. The first DopaFit gym was launched in Feeding Hills in 2015, but moved to the Eastworks building in Easthampton a year later. This year’s move to the Red Rock Plaza in Southampton was a bid for more space; ample parking right outside the door and a handicapped-accessible entrance are pluses as well. 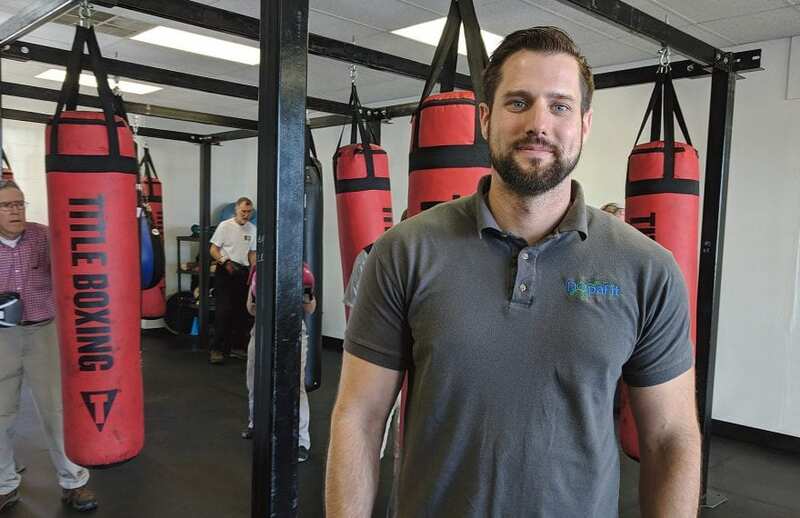 Meanwhile, a second DopaFit location in West Boylston — Moir lives in Worcester — boasts about 20 members. The Southampton gym runs classes four days a week — exercise groups on Monday, Tuesday, and Thursday, and a yoga session on Wednesday. “Most people come two or three times a week, but some come every day,” Moir said, adding that members with jobs often make time for exercise before or after their work schedule. Individuals are referred to DopaFit by their therapists, neurologists, movement-disorder specialists, and family members as well. “Some go to their neurologist, who says, ‘you need to exercise,’ and they find out about us, exercise here for six months, go back to the neurologist, and their scores are better than they’ve been. When the neurologist finds out they’re going to DopaFit, they reach out and start referring more people. The proof is in the pudding. When they first arrive at DopaFit, members undergo an assessment of where they are physically and where they would like to be in six months. Then they’re assigned to one of two exercise groups. No Limits is made up of people who don’t need assistance getting in and out of chairs and can move about freely with no assistive equipment, like canes, walkers, or wheelchairs. The second group, Southpaw, requires a little more assistance. Not to mention that exercise can be fun, Enright said. Between the business and his studies, Moir doesn’t have a lot of time to stand still, but he said he occasionally allows himself to step back and let the potential of DopaFit sink in. 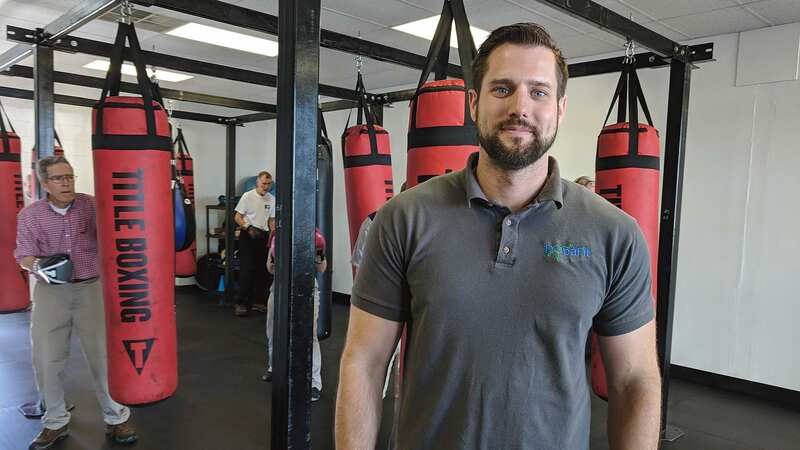 “I’ve been so deeply involved in it that I forget how special this really is,” he told BusinessWest, and not just because of members’ physical progress, but their growing confidence. 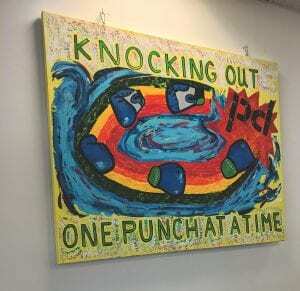 In addition to the exercise and yoga, DopaFit also hosts the Smile Through Art Workshop once a month, an art program for individuals with Parkinson’s disease that’s run by Moir’s wife, Saba Shahid. Moir has certainly navigated his own path since those days when he was so angry about his mother’s death that he couldn’t even think about Parkinson’s disease.